The long-range marksmanship of Barlow junior Jesse White has been one of the stories of the young boys basketball season. 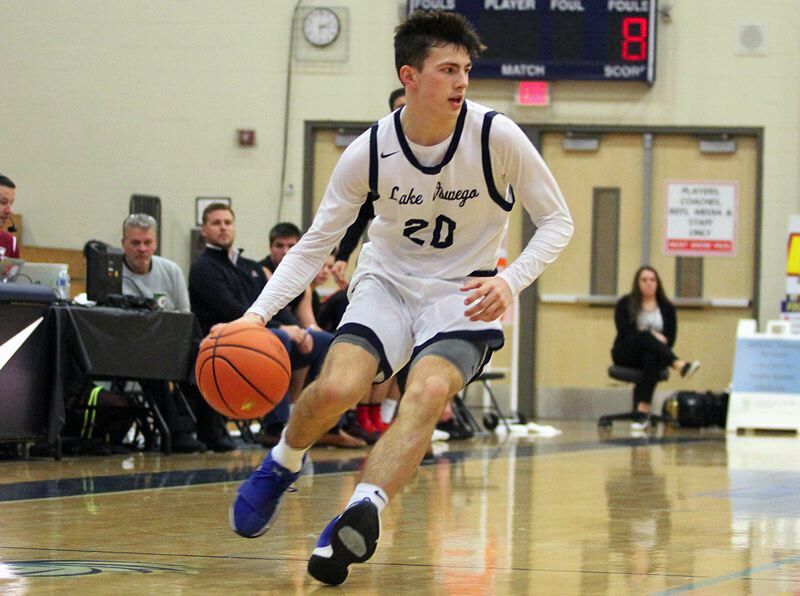 But Lake Oswego has its own sharpshooter in senior Josh Angle, and on Tuesday night, Angle and the fifth-ranked Lakers one-upped White and the top-ranked Bruins. After White hit a tying 3-pointer with 12 seconds left, Angle drove for the game-winning basket with three seconds remaining to give Lake Oswego a 68-66 win in a hotly contested Class 6A nonleague game at Lake Oswego High School. Angle made four 3-pointers and scored 32 points to offset another big night from White, who hit six 3-pointers and scored 31 points, matching his 31.5 season average. "You got to see the two best shooters in the state tonight," Lake Oswego coach Marshall Cho said. "They just make shots in different ways. It was fun to see them go back and forth. That was a great battle." With the win, the Lakers improved to 5-1 on the season and shook off a 60-55 loss to Central Catholic four days earlier. Barlow, which took over the top spot in the OSAAtoday 6A coaches poll after beating Jefferson in double overtime Dec. 7, fell to 4-1 with the loss. Barlow appeared to be in control when it built an 11-point lead in the third quarter against the Lakers, who were playing without their starting point guard in sophomore Wayne McKinney, who missed the game due to illness. But Lake Oswego went on an 11-0 run that spanned six minutes, pulling even at 51-51 on a three-point play by Angle with 6:19 left. Barlow surged ahead 62-57 after that, but Angle made a 3-pointer to spark an 8-0 as the Lakers took a 65-62 lead with 45 seconds left. "They had momentum going their way and they kind of rode that wave," White said. Barlow trailed 66-63 before White hit a deep 3-pointer to tie the contest at 66-66 with 12 seconds remaining. The Lakers opted not to call timeout and Angle banked in a driving shot with three seconds left for a 68-66 lead. After that, a halfcourt heave by Barlow junior Joey Wolcott fell short and the Lakers were winners. "Coach gives us a lot of trust to make plays like that," Angle said. "So when it came down to crunch time, he trusted us to make a play and we were fortunate enough to do so." Angle said he took advantage when junior Sam Abere and senior Brandon Roberts spread Barlow's defense by running to the corners. "We always preach every day in practice to spread the lanes well, so they just spread the lanes and it just kind of opened up for me," Angle said. "Nobody stopped the ball so I just went all the way downhill and was lucky enough to make a tough layup." Cho said the Lakers' comeback reflected on how they have grown from a middle-of-the-pack team to league-championship caliber in recent seasons. They have proven resilient when trailing in several games this season, even in Friday's double-overtime home loss to No. 9 Central Catholic. "They just kind of started to believe, and anytime adversity hits, they start to kind of rally together, and that's exactly what happened today," Cho said. "Our student section, our fans, just willed us to that comeback. "I think one thing we're going to be known for is we're never going to quit. That's an identity. That's a program culture. They exhibited this tonight." Angle – who scored 14 points in the fourth quarter, including three 3-pointers – said the Lakers pride themselves on having a "next-play mentality." The way they overcame the Bruins should give them a boost heading into the Les Schwab Invitational Dec. 26-29. "Coming out of it, we know we're as tested as any team in the state," Angle said. "We've gone through a lot of top-five, top-10 programs and had our fair share of adversity. So coming out of it, we're as strong as ever and looking forward to the next phase of the season." Lake Oswego also got 14 points from Abere, who took on more of the ballhandling duties in the absence of McKinney. "For the first five games, Wayne and Josh have been our main scorers and Sam's been our third option," Cho said. "But tonight, he needed to step up and attack the gaps a little bit more and be assertive. He did that tonight." White made 12 of 26 shots, including 6 of 11 from 3-point range, for his fourth 30-point game of the season. Barlow junior guard Evan Inglesby added 11 points, well off his 24.3 average, for the Bruins, who fell to Lake Oswego for the third consecutive December. "We knew it wasn't over by any chance, but we gave it away, so that's on us," White said. "We've got to be smart with the ball. Our offense is a bit stagnant, I'd say. Maybe that's partially because of me. I think that going forward we've got to have more movement and cuts and stuff like that, get easy ones." Jerry Ulmer writes for OSAAToday.